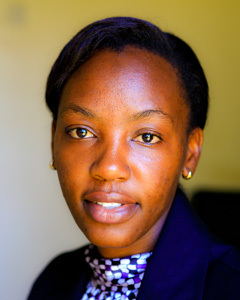 Angella is a Kenyan trained lawyer mainly focusing on legal research. She is an Advocate of all courts of Kenya. Before joining the firm, Angella worked in The Office of the Honorable High Court Judge, George Vincent Odunga at Milimani Law Courts in Kenya. Angella is passionate about sports and is an accomplished basketball player. She featured on the Uganda Ladies Basketball Team (Gazelles) in 2009 – 2013. She is developing the sports law arm of the firm. She handles registration and compliance requirements for Clients. These include incorporation of companies, engagements with the government staff at Lands, Companies.